If you're like me, you tend to enter a room with your eyes before your ears or nose or fingertips make it inside. The first thing you notice in “Calm. Smoke rises vertically.”—Wendy Jacob’s exhibition at the Radcliffe Institute’s Johnson-Kulukundis Family Gallery—are the miniature buildings perched on simple saw-horses arranged in a grid pattern around the gallery. They’re mostly places you’d recognize—the Parthenon, the U.S. Capitol. Some are more generic: there’s an airport hangar with a plane, and a skyscraper and a Catholic church. There’s a pyramidal building which turns out to be the Tower of Babel. The objects look a bit clunky–roughly hewn, and worn down–which makes sense: they weren’t meant to be looked at, but touched. 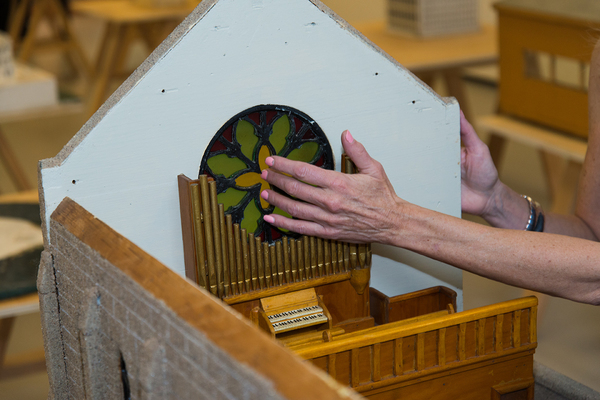 The late 1930s gave rise to two parallel WPA projects to create tactile models for blind students: one in collaboration with the Perkins School for the Blind in Watertown, and the other with the Ohio State School for the Blind. The models were constructed with tactile experience in mind—construction techniques were tailored to provide detail and clarity of scale and texture for the fingertips, not the eyes. An interest in Perkins and its models brought artist Wendy Jacob, RI ’05, to the Boston area. I worked as her research assistant while she put the exhibition together. Our first efforts to learn about the history of the models hit a wall when we learned that most of Perkins’s records of their creation had been destroyed. We followed what little paper trail there was, reading records of conventions for educators of the blind and school newsletters, which eventually led us to the parallel project that had taken place at the Ohio School for the Blind, where what models remained were being stored in a bowling alley. The use of tactile objects in the education of the blind dates back to the 1800s, when the Institute for the Blind in Copenhagen made efforts to educate students through direct perceptual experiences, rather than through verbal explanations, as educators had previously done. How do you give students a concept of something they will never see? It’s hard for sighted teachers to see the gaps in their descriptions: until confronted with a to-scale tactile model, one student believed the average rat to be the size of a rabbit. The models are accompanied by an audio component, seeming first like conversations in the rooms surrounding the exhibition. It’s actually a rumbling baritone sound, emanating from the walls of the gallery. You have to press your ear right up against the paint to discern what, exactly, is being said. In one place there’s a weather report, which turns out to be an up-to-date report of what the meteorologists believe to be happening outside today. In another, a deep voice describes each level of the Beaufort scale, which empirically categorizes wind speed in terms of sensory perceptions of the weather. (The exhibition takes its name from the scale’s 0-mph definition: “Calm. Smoke rises vertically.”) The last sound is the hardest to identify. It comes from a microphone, a small black dot stuck to the outside of the gallery’s window, funneling the sounds of the outside world into the gallery space. The exhibition plays with the distinction between direct perception and perception mediated through description. The current weather, presented as a report, gives very different information from the sounds the conditions themselves produce. It’s one thing to tell a blind student what the Parthenon looks like, and another to let her use a tactile model to see for herself. Jacob has been interested in architecture that exceeds the visual realm for a while now: in the past she’s installed walls that breathe and furniture that hugs. She tells me how she’s fascinated by the Perkins School buildings themselves. The particular timbre of the smack of shoes on the tiles can locate someone without sight. The windows channel the breeze in such a way that its feel on your skin can always tell you in which direction you’re moving. Sometimes sight is a disadvantage: when I first visited Perkins to check out the WPA models on Jacob’s behalf, I found myself totally lost in a tangle of corridors built for people with abilities different from my own. Walking right up and laying my hands on the little Parthenon makes me feel in-the-know. Jacob doesn’t like explicitly telling viewers to touch her work: it turns the tactile experience into a novelty. The specific sensations are engulfed by the cheap revelation of getting to transgress on the childhood mantra to “touch the art with your eyes only” (something I heard a docent actually tell a teenager caught fondling a work by Ai Wei Wei last week at the Sammlung Boros in Berlin). Jacob is more interested in what it means to see with the fingers rather than touch with the eyes. Of course, the fingertips see a bit differently. Vision operates from a distance. The photons that strike our eyes tell us about the things that do not press up against our bodies. Touch requires immediate skin contact. Even without the overwhelming feeling of transgression, running your hands over an object in a gallery is an oddly personal experience. We associate paying attention to what our skin is telling us with sexual intimacy. Here the intimacy isn’t sexual but something else. Jacob’s exhibition eliminates distance apprehension: it both brings us closer to the objects and helps us examine more closely our experience of our own perceptive faculties. Seeing the model—with my eyes and my fingers—I am seized by the sense that I am at once inside and outside of the space, feeling the same floor with my feet and my fingertips, seeing myself from above. I contain a mental image of the space that contains me. The audio does the same thing—the sound inside the walls conveys what is outside the gallery to its inside. The walls become permeable, bridging the gap between indoors and out, between description and perception, between mental concept and sensory apprehension. The visitor—I am deliberately not using the word viewer—experiences the sensations of being without and within at once. Some sensory experiences are not available to the most able individuals: we cannot know what the physical vibrations of the sounds we hear feel like to a deaf visitor, or what the Parthenon looks like to a Perkins student. Our eyes might be sighted, but compared to those of someone without vision, our fingertips are blind. We make do with what we have—descriptions of the weather, a scale that teaches us to recognize the speed of the wind, tactile models—to apprehend the world around us. It has to be enough. Berta Greenwald Ledecky Undergraduate Fellow Lily Scherlis ’18, a joint concentrator in comparative literature and visual and environmental studies, is looking more closely.